JOURNAL HISTORIA (p-ISSN: 2337-4713, e-ISSN: 2442-8728) is a scientific journal published two times a year in February and August with the number of articles 12-20 per year.Was established on February 5, 2013. Historia includes articles on the results of research and scientific work with the scope of history education, history science and social sciences. 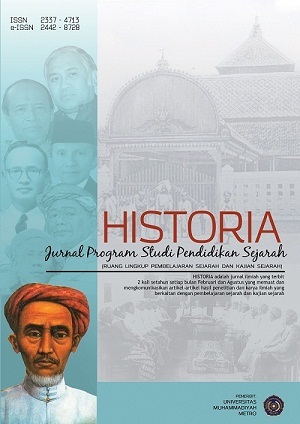 The Historia journal is managed by the History Education Program, University Muhammadiyah of Metro, published by the Scientific Publication Unit University Muhammadiyah of Metro collaboration with the MSI (Society Historian Indonesia) Lampung. Need a Username / Password? HISTORIA by Pendidikan Sejarah UM Metro is licensed under a Creative Commons Attribution 4.0 International License.